I eat a fair bit of Chinese food at restaurants. Asian foods are one of the places you can generally count on being able to get enough vegetables in your meal, so Chinese is my go-to cuisine when I really want veggies. In recent years, though, I’ve been noticing just how salty is always is, and it seems there’s more and more meat in dishes and fewer veggies. Sometimes I’ll just get a pile of vegetables and steal a few chunks of meat from my husband’s plate, but that meat is certainly factory-farmed and the veggies shipped in from who knows where and I always leave with lots of containers of leftovers…so it’s not an ethicurean dream food. But what’s a girl to do? There’s just nothing like that delicately-scented white sauce, or the rich brown garlic sauce, or the spicy orange glaze. How the heck does one replicate that at home? Might as well just go out. Actually, it turns out it’s pretty easy to make all of these sauces at home. You can adjust the salt to your taste, use meat and veggies that suit you, and keep the leftovers in a reusable container! The only tricky bit (until you’ve done it a few times) is working with cornstarch. See below the cut for recipes and techniques for Basic Chinese White Sauce, Basic Chinese Brown Sauce, and Spicy Orange Glaze. These are not haute recipes. They are almost certainly not authentically Chinese. But they do replicate fairly well those sauces we’ve come to like at American Chinese restaurants. 1) Cook any meat first. Remove it from the pan. 3) Mix up all the sauce ingredients in a measuring cup. 4) Add a few pieces of hot veggies to the measuring cup to pre-heat the cornstarch. 5) Dump all the sauce into the pan with the veggies (and add the meat back, if using) and bring to a boil. 6) Simmer for a minute or two until the sauce is clear and thickened. Follow the basic directions above. Follow the basic directions above. This sauce should be much thicker than the others; it’s great on chicken and tofu. See also my Sweet and Sour Sauce recipe. Oooh, I am going to try the spicy orange glaze recipe. One chain restaurant that I do like is Panda Express (I think it’s called?) that’s in the EMU student center. Whenever I take a night class there, I eat the orange chicken. Thanks, Emily! I so agree. We eat lots of veggie stir fries because it’s a great way to get your veggies. I find that I can get my son and husband to eat them more readily too. We’re trying the brown sauce tonight! Jeez Angela, thanks for this input!! It has really helped me in my search for a Chinese Orange sauce… I would stay and say more but I have to get back to my research. You mentioned working with corn starch being tricky… that’s always been the case for me. How do you keep the corn starch from clumping together? I made the brown sauce this week–yum! It is so easy, what’s not to love? Thank you! I was so happy to find this. I’m trying to eat healthy and just bought a two tiered steamer so I’m steaming veggies and meat/fish and was looking for different sauces I could add to this. Can’t wait to try them all. i am kathir i working in a bangalore.i need some chinese recipies. Thanks so much for figuring these out. I’ve also always thought that the sauces at Chinese restaurants were something I could only find eating out… now I can’t wait to try your version! I cant wait to try this recipe! It looks so amazing and simple to make! would you happen to know the recipe to the topping they put on the mussels at the chinese buffet. i am going crazy looking for it. Sorry, Julia…I’m not even sure I’ve had mussels before. Good luck with the search! That topping on the mussels and salmon is simply mayo, cheese and garlic. Some use parsley in it also. I wish they wouldnt do that. Any idea about the recipe for lemon sauce. It is that clear yellow sauce with the same consistency as sweet and sour. Can’t seem to find a good one anywhere. Will be trying the brown sauce soon. Had tried one before that called for oyster sauce, by wife wasn’t too big on that. I’d try a cup of chicken or veggie broth, a big squeeze of lemon, a tablespoon of cornstarch, and salt and ginger to taste. Combine water and sugar in medium saucepan. Cook over medium heat until sugar is dissolved. Add lemon juice and cornstarch mixture and bring to a boil. Stir frequently and cook until sauce is of desired consistency. Taste and add sugar or lemon juice if needed. Add food coloring, if using. This sounds really simple and, with the exception of the fresh ginger, all the ingredients are staples in the kitchen. Thanks for posting! finally!! found a brown sauce for chinese food. chinese food is all about the SAUCE. THANKS. THANK YOU! I am going to try the brown sauce tonight. Can’t wait. won’t adding soy to the whit sauce make it a brown sauce? I want a spicy whit sauce and I guess just add red pepper flakes? I like shrimp in white sauce spicy with mixed vegs. there was talk of ginger and garlic. ???????? Use chicken broth instead of water, and little or no soy sauce. Lots of ginger, some garlic, and pepper flakes or cayenne if you want it to be hot. Thanks! I appreciate the recipes. They are just what I was looking for. I’m glad I found your website. When I asked my local Chinese restaurant cook what was in the white sauce his answer was “white sauce”! lol My question is: can these sauces be made in some sort of quantity and saved in the refrig or freezer? I have college students coming in at different times to eat and they’re preparing dinner for themselves. 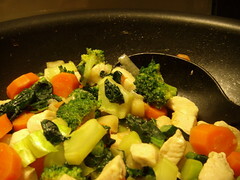 I”d like to make it as easy as possible for them to make chicken and broccoli (their favorite Chinese take out) so they won’t turn to the usual bowl of cereal for dinner. I just found your site and we tried your White Sauce recipe this weekend and it was HEAVENLY! My husband loved it too, though he requested a slight tone down of the ginger in future. It would still be good that way! This was SUPER easy. I can’t think of an easier recipe. We had this just on broccoli that was lightly steamed and then dropped into a sautee pan with a little olive oil and then your sauce, per your instructions (we love steamed broccoli). I think tomorrow I will do this with a variety of vegetables that we have. But I have to say this was so PERFECT just on the broccoli. Perfect consistency – not too thin or thick. Light, fragrant, absolutely delicious. Thank you for sharing your recipes with us! These sauces sound wonderful. Will try this evening. Thanks for sharing. Beverley. OH THANK GOODNESS!! I know of only two Asian restaurants in my area that do veggies the way I like them (not to soft, not to crunchy) and have reasonable prices. Thank you for the recipes. Nothing beats a home cooked, wholesome, meal! My husband has a passion for anything to do with chinese food. With our budget it is a treat to order take-out, so I have been scrambling for the right recipe for sauces. Thank you so much!!!! The lemon sauce made frozen salmon seem like the catch of the day. Now my budget friendly meals have been given new life. Thanks so much for this. I have been really missing orange chicken ever since I became a vegetarian a little over a year ago and none of the Chinese restaurants around here offer the orange sauce with veggies. I just tried the orange sauce this morning and it was really good! It was a great replacement for the restaurant kind and I like that it uses pretty much all whole foods. Which of the recipes results in that great light colored sauce, so common in Chinese food in this, which usually goes with chicken or shrimp and various vegetables? I believe the liquid base is chicken stock. Thanks. That’s the basic white sauce. Really, you can use any sauce on any combination of vegetables and protein. I love the brown sauce on beef and broccoli. I’ve been experimenting with this kind of basic recipe for years since I became vegetarian and I love the convenience, the nutrition, and the taste. I am wondering if you have any similarly simple recipes for Thai food? I love the Thai flavor, but find it difficult to make good Thai food without a curry paste or some difficult to find (in my area) Thai basil. My only vaguely Thai dish needs curry powder and canned coconut milk. Add also a can of tomatoes and a bunch of veggies and you get a passable coconut curry. would love a “real” Pad Thai recipe! FWIW, I find regular basil works fine for Thai food. Lime basil is also good, and very easy to grow in a pot on a windowsill. I’ve been making Bittman’s pad thai recipe (with variations in veggies, etc.). Key ingredients are tamarind paste and fish sauce, which I now keep on hand. I’m going to try your brown sauce tonight! Glad I found this page! Quick question, is 3/4c cups? Refer to the brown gravy recipe. Thanks for your reply Emily. I used cups! The sauce smelt absolutely delicious, but the flavour was not so strong. I’m in uk, so molasses is not something I have in my cupboard! I used a little soft brown sugar and a beef stock cube as well as the cornflour. I wonder if not using the molasses, affected the flavour? Treacle is a possible substitute for molasses, if you have it. Not sure if the proportions would be the same – start with just a small spoonful and see? This sauce is a fairly mild one, almost like a gravy. You can add more garlic and ginger, or even some hot pepper, to boost the flavor. clear subtle sauce… sounds like “ching chao” or “simply cooked” for non chinese speakers…. it works pretty well for most things such as veges and seafood where the main idea is to taste the main ingredient. the key idea is to go easy on the soy sauce and keep the list of ingredients simple and fresh produce. the stock is of utmost importance although knorr surprisingly make quite good chicken powder (the one you can find in asian market where it doesnt contain bits of parsley and other nonsense) for use at home and is a good substitute for fresh stock. Try a shake or two of white pepper this will give you a touch of spice that you need. Looks great! Giving the Brown Sauce recipe a shot this evening. Or should I do orange? Hmm. It’s a toss-up, but one thing’s for certain – our stirfry won’t be boring tonight! Would you happen to know a recipe like this for honey sauce? My family loves it with chicken but the only place we’ve ever found it was at a chinese resturaunt that closed down about two months ago. I’ve not had honey sauce, so I’m not sure what to aim for. Could you swap out honey for the orange juice in the orange sauce and see if that comes close? So happy to find doable recipies! We had great food out last night, not fatty aftertaste and vegetables tasted steamed. The sauces were great one was a black bean sauce and the other was Oyster sauce in the sauce. I’m thinking your white sauce with some Oyster sauce in it. It was over beef and brocolli. the black bean was over mixed winter veggies and chicken. Thanks for the inspiration to try it at home. I liked the instructions but I thought the brown sauce a little on the bland side. Next time I will substitute organic brown sugar for the molasses and organic chicken broth for the water. All in all great tips! Greatrecipes I need sauce to swallow no saliva glands. Any chance you do Mexican or even sauces for fish recipes? Thank you for making dinner a little easier. For Mexican, try tomatoes or tomato sauce, cumin, chili pepper, garlic, and a touch of oregano, plus fresh lime juice and cilantro…hard to beat. Find interesting ground chili peppers at a Mexican grocery store – or check the Mexican section of the grocery for adobo or chipotle sauces – they add a great smoky flavor. Thank you for a lovely orange sauce recipe! this is the american style…. my husband’s recipe is more intense. Fab recipe…been trying to track this down for ages! None of these recipes will store without separating. You can try storing them in a jar, then shaking before use, but they’re so easy to mix up I just always make it fresh. Looking for the white sauce they use in a resturant called China Buffet,,It’s kinda creamy,doesn’t taste like coconut milk in it but they say it is..any sugggestions?? ?..I really like this stuff..They put in on shrimp and cut chicken.. Sorry, no idea! Small amounts of coconut milk don’t taste like coconut; you could try the basic white sauce and add a spoonful of coconut milk and see if it comes close. A dressing for Asian slaw? 2 Tbl soy sauce, shoyu, Bragg’s, tamari, etc. I’ve made these sauces countless times now. They’re foolproof, fresh, light, unbelievably simple and deliciously flavorful. Thank you so much for sharing! Buying a passive solar home!